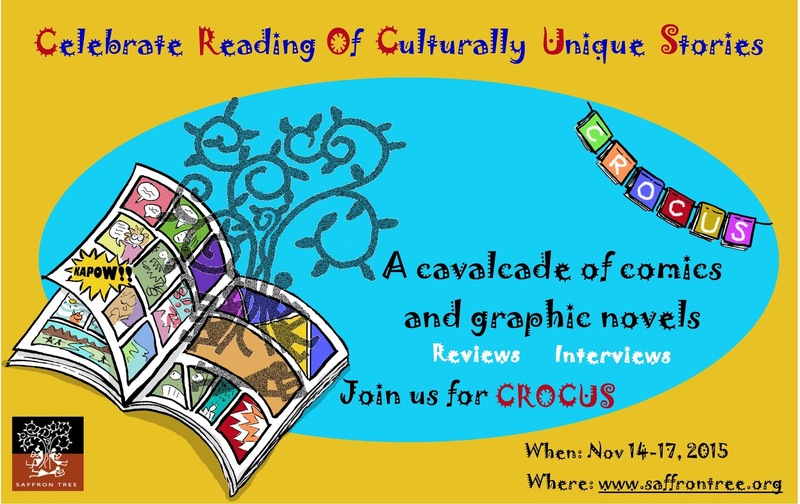 And already it is time to wrap up this year's CROCUS which was devoted to Comics and Graphic Novels! With over 30 reviews and many of them of book series or clusters, we are sure you will be spoilt for choice. The subject of the graphic novels were varied- you saw books ranging from Girl power (Roller Girl, & Rapunzel) to the giggle-worthy Monster on the Hill, Bird & Squirrel, plus Owly series, from Shakespeare ( Macbeth) to the gorgeously illustrated works of Raymond Briggs, from Primates & Darwin to the Holocaust and much much more. You will find something for every reader's taste. CROCUS has the ST team working to bring you these treasures in a cohesive, timely manner. Sheela was truly the guiding force behind this year's initiative and she prodded us gently to meet timelines, smoothed out doubts, ensured all was in order, in conjunction with Praba. Besides doing that, they also contributed a lot of reviews. Lavanya's flyer is always exciting and this one was no exception. Kapow! it made a strong impact. Satish with his quirky comic rendering of the reason behind the theme choice, also is an ardent fan of the genre. Both brought us a lot of reviews, not just now but also in the past at ST.
Sandhya's Down memory lane post had us reaching for our favourite Phantom or Asterix comics again. Madmomma, Ranjani and Choxbox, brought us a well curated and inviting set of books. The guest post by Vinitha Ramchandani was truly educative and Arundathi's interview with Nicki Greenberg from Australia and Praba's chat with Sayan Mukherjee were delightfully insightful. If you have not had your fill of graphic novels, here is a list of some of the lovely collection of graphic novels reviewed at Saffron Tree over the years, the first as early as 2008. You will see Indian publishers such as Tulika and Penguin,Walker and Scholastic, all have great offerings on themes as classic as Dickens to as contemporary as Science Club Adventures. Sathish and Wordjunkie remain the top contributors to this genre reflecting their passion and love for it. And can Sheela & Sandhya, our most regular reviewers, not have contributed? Soak in and read these books. We will ensure we keep bringing you interesting books, do leave us a comment to let us know what you think once you have read them or just that you are reading our reviews! Thanks for the precise summary!